It’s always most difficult to take that first step: but after that, you’ve got momentum on your side! Big, bold decisions take guts, but inevitably, things will come to the point that it is clearly time to get moving. Action becomes inevitable. Initiative becomes oxygen. Decision-making is hyper-fuel. Once you recognize that and get going, align to the momentum and prepare yourself for the ride! What have I observed with over 25 years of experience in watching people and organization fail to align to fast trends? To miss opportunities for innovation and slide into inevitable sclerosis and failure? Often, it’s this: an inability to take on the big decisions. Fear, uncertainty, worry, indecision. Organizational sclerosis clogs up their ability to move forward. They die. There’s a reason the first part of my mantra involves the world “BIG” : Think big, start small, scale fast! Thinking BIG will fill your tank with courage, because it will give you hope, a sense of opportunity, excitement for the future, even though there might be some trepidation with the unknown. But that can be a better space than being stuck in the inevitable rut. The first of these events was a leadership meeting was for Columbus McKinnon, a manufacturer of overhead cranes used in manufacturing, entertaining, shipping and logistics; the second was for the Canadian Finance and Leasing Association. The first group asked me to outline for several hundred of their engineers and sales staff how the essence of what they build and sell will change as they become ‘smart and hypercpnnected;’ the other wanted a talk that put into perspective the fact that the very nature of what they lease will change through such connectivity. Here’s the thing: most #IOT (Internet of Things) projects today are a complete failure – they are insecure, built on old outdated Linux stacks with mega-security holes, and ill-thought out architectures. My slide on that fact? Simple: a reality which is already happening today. This type of negligence will doom of the future of the products of many of the early pioneers. So here’s the thing: if organizations are going to build a proper path into the hyperconnected future, they need to understand and follow my “11 Rules of #IoT Architecture.” Read it, print it, learn from it : this is what you need to do as you transition to becoming a tech company. Some of the biggest organizations in the world have had me in for this detailed insight – maybe you should. My inspiration for how to build the future right comes from Apple’s robust Device Enrolment Program architecture, which lets an organization deploy, manage, upgrade and oversee thousands of corporate iPhones or iPads; and Tesla, which is not really a car company, but a hi-tech company. And so in both of these talks, I put into perspective how Tesla has (without knowing it, LOL) been following my rules. 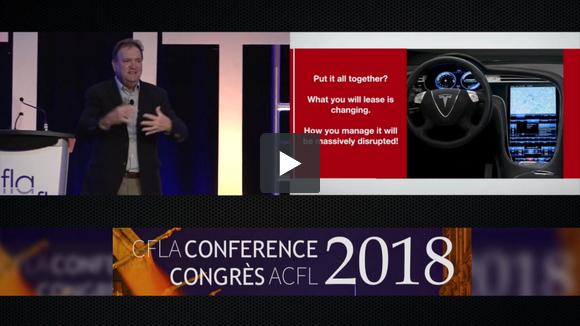 First, think about what a Tesla really is – here’s my slide…. Go through my IOT architecture list and think about what has been engineered into the computer that is a Tesla. “Upgradeable: any device should have the ability to be upgraded from afar, automatically, either by user choice or centralized management”. Got that. Consumer Reports didn’t like the braking distance on the Model 3. No problem: that’s a software update. You can do that when you buy your Model 3. “Self-repairing: better yet, it should not only know when things are going wrong, but have the capability to fix it once it is aware”. Let’s fix it at night…. User/driver interactivity is at the heart of operator interaction. Built in. And yes, there’s an app for that (above). “Swarm data-generating: it should be able to generate types of information that, in concert with other similar devices, is able to be manipulated to provide some unique operational, predictive or maintenance-information data-set (or more)”. It’s a data gathering machine. As in, a new AI based, neural network…..
Vehicle-to-grid connectivity is a huge trend!Tesla isn’t participating fully yet, but it will. Your car battery becomes a part of the energy grid…. Here’s the thing: Elon Musk understands the need for a great IOT architecture. Most CEO’s of Fortune 1000 companies don’t, and until they get someone who does, their project will be a fail. They’ll likely put the future of their company at risk through security and privacy failures, product failures and more. Get with the program, folks! It was pretty ironic to be doing a talk a month ago on the future of manufacturing – at the Trump Doral Resort in Miami nonetheless – at the same time that trade barriers were being put in place to try to take an industry back to where it was in the 1950’s. What I’ve learned from 25 years on the stage is that some people will blame everyone else but themselves for their lack of success. And when failure comes, it is the fault of everyone else! The quote captures the essence of their mindset. We live in interesting times, where some believe that with a wave of a magic wand, an entire industry can be transformed overnight and returned to its former glory. It won’t happen like that, folks. It will happen through constant innovation, big bold moves, skill set reinvention and challenging thinking that will – and already is — providing for significant transformation. The future of manufacturing is all about adapting to collapsing product lifecycle and reinventing products faster The connectivity and intelligence that comes to products through the Internet of things (IoT) connectivity Mass customization. Digitization, robotics and the cloud. Design based on crowd thinking. Rapid prototyping and deployment. Faster time to market. 3D printing or additive manufacturing. My talk last month might have worked for some folks, and if I saved them from their thinking, I will have succeeded. But I know that there were likely others in the room who would not have liked my message – they are on the train of thought that by trying to stop the future, you can return to the past. In other words – they are likely doomed to fail in the future, because they will make little effort to actually get there! Here’s a clip from a recent keynote. It’s part of a talk where I cover 20 Disruptive Trends, and put into perspective why the future belongs to those who are fast! In this short clip, I cover trends involving batteries, self-driving, 3d printing, the space industry, genomics, health care knowledge, and more! Including why I can drink more coffee than other people! I’ve got a keynote topic description coming around this, with a draft below. For any executive, these trends matter — because fast trends drive disruptive change. And disruptive change envelopes us in terms of fast trends: self-driving cars, 3d printing, crowdfunding, the sharing economy, blockchains, personal drones, swarm-bots, smart dust, vertical farms, the Internet of Things, cognitive computing, smart factories, artificial intelligence, augmented reality, quantum computing, intelligent farms, smart clothing! What seemed to be science fiction just a few short years ago has become a reality today, as time compresses and the future accelerates. For the last 25 years, Jim Carroll has been speaking to and advising some of the worlds largest organizations on the trends that will impact them. With a client list that ranges from NASA to Disney, the Swiss Innovation Forum to the National Australia Bank, Johnson and Johnson to Godiva Chocolates, Jim has had a front row seat to the massive change being encountered in industries worldwide, and deep insight into the leadership mindset of organizations as they adapt to the era of acceleration. In just a few short years, it will the year 2025, and the world of tomorrow will be your reality of today. Are you ready for what comes next?